Last year around this time Cheryl tasked me with making some haggis for a Burns Night, an annual celebration of the Scottish poet Robert Burns held on his birthday January 25. Basically a good excuse to get together, drink whisky, and eat some haggis. The problem last year was we came up with idea on January 23rd two days before the holiday. Pretty difficult to source what you need for haggis in two days. In the end I found some at Gepperth’s Market and we had our Burns Night. This year however I was intent on making haggis from scratch and set a reminder to start the planning. Cheryl and I both like haggis. She studied abroad in Edinburgh and her sister Shelly lives there so we get to go over for visits, like last October when her sister married a furry Scotsman. On a prior trip Ross (new brother-in-law) picked up a haggis from his local butcher and made us a traditional dinner of haggis, neeps and tatties (turnips and potatoes). It’s kind of like a hash stuffing but most people just can’t get past the ingredients which are primarily sheep lungs, heart, and liver, all cooked inside a sheep stomach. Mmm mmm good. As you can imagine the really tricky part about making haggis here in America is sourcing the ingredients. I don’t think you can legally buy sheep’s lungs (or any animal lungs) so it’s more of finding a way to modify the ingredients yet keep kind of in the ballpark. None of my trusted cookbooks have a recipe for haggis so I searched around the interwebz to see how others cope with this problem. From what I could find beef liver, lamb shoulder, and lamb kidneys are acceptable substitutes when it comes to sheep lungs, heart, and liver. More common casings like beef middles or bungs are also used instead of the stomach which apparently are disgusting to clean. I was surprised at how easy it was to assemble the haggis. Boil the meat, chop it up, add some oats and liquid, then stuff. That’s it. And cooking the haggis is even easier. Just boil it in water for a couple of hours. 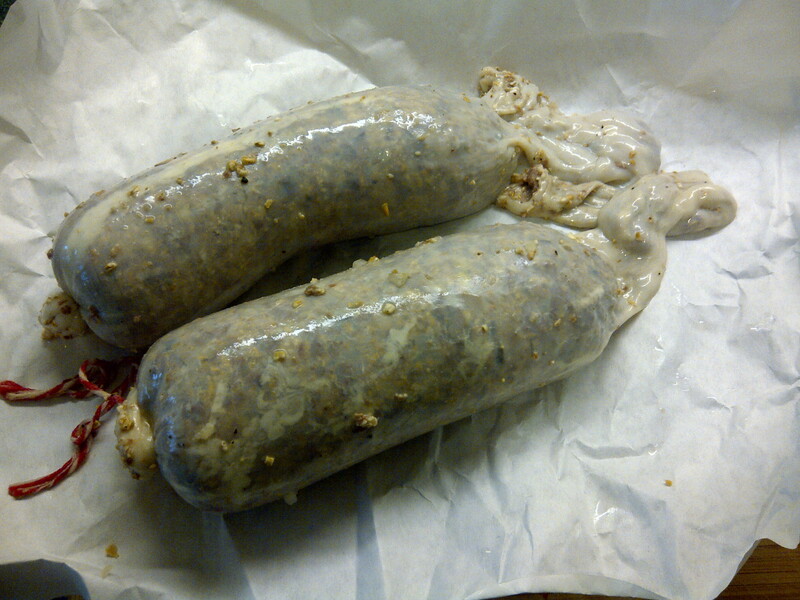 The only trouble you can run into is when you stuff too much haggis into the casing. It will expand so you should only fill the casing halfway or it may burst and then you’ll have a big mess in your pot. Casings stuffed halfway and ready to be tied off. Even though I used non-traditional cuts for my haggis it turned out well. It tasted good and wasn’t very dry. I think it may have had a little too much oatmeal but that’s just nitpicking. I also didn’t grind the meat, opting to finely chop the meat instead which gave the haggis a nice texture. 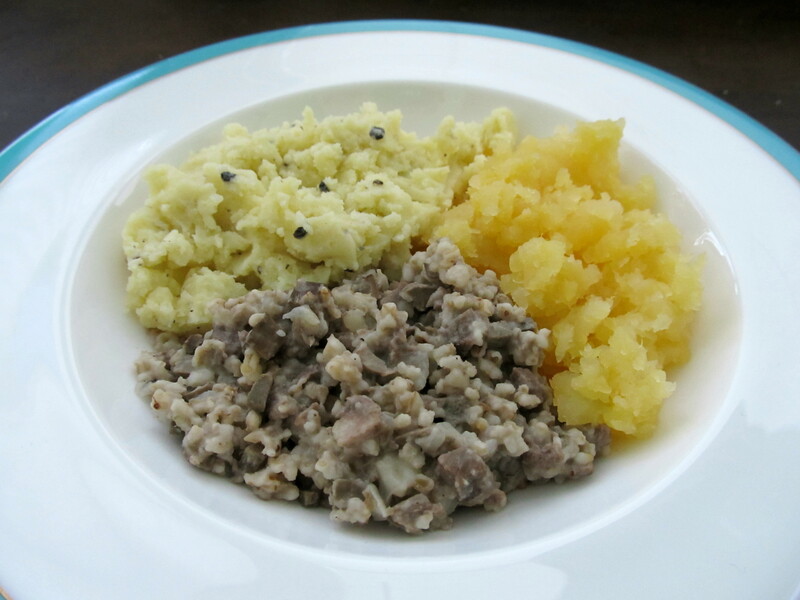 To be honest, I think this haggis recipe would also work great as a stuffing for chicken or other type of bird. The recipe below is enough to make about 2-1/2 pounds of haggis or enough for two individual ones stuffed into beef middles. I cooked one and froze the other. I want to give a big thanks to Gepperth’s. All of my curing and sausage making endeavors are made easier by them. They’re not a huge butcher shop but they are very helpful, usually have fresh pork belly, make their own fantastic sausages, and always come through when ordering special cuts or items like sausage casings (or haggis ingredients). In a city where butcher shops aren’t uncommon they really stand out for me in terms of service. Boil the meat for an hour. Remove from the water and set aside to cool. Chop the meat up into a fine dice, but grate the liver. Dice the onions and suet. Mix them all together in a large bowl. Put the oatmeal on a cookie sheet and toast in a 350°F oven for about 20 minutes. Give it an occasional stir/shake to ensure even toasting. Add the toasted oatmeal to the meat and onions and mix all the ingredients together with the C of stock. Tie off one end of the beef middle and stuff from the other end. Fill the casing halfway. Tie off/Sew up the end and prick the casing with a needle so it won’t burst while cooking. Boil in water for 2 to 2 ½ hours. Serve with ‘neeps and ‘tatties, and plenty of single malt.